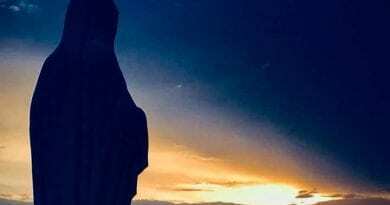 If you are Catholic, you have, undoubtedly, heard Our Lady referred to by many titles and perhaps you have wondered why so many and what do they mean. You may be familiar with some and never have heard of others. One of my favorite titles for Mary is Theotokos, a Greek word meaning Mother of God, or God Bearer. There is an honoring sound to the word and Our Blessed Mother surely deserves all the honor given her. Some of the more familiar titles for Mary are Queen of Heaven, Mother of Mankind, Our Lady of Sorrows or Star of the Sea (Stella Maris) and there are titles which refer to her apparitions; Our lady of Fatima, Our Lady of Guadalupe, Our Lady of Beauraing, Our Lady of Lourdes and more. Why so many? What do they mean? These titles are organized in what we would think of as categories.The first three are the introductory titles which address Mary’s holiness; Holy Mary, Holy Mother of God and Holy Virgin of Virgins. 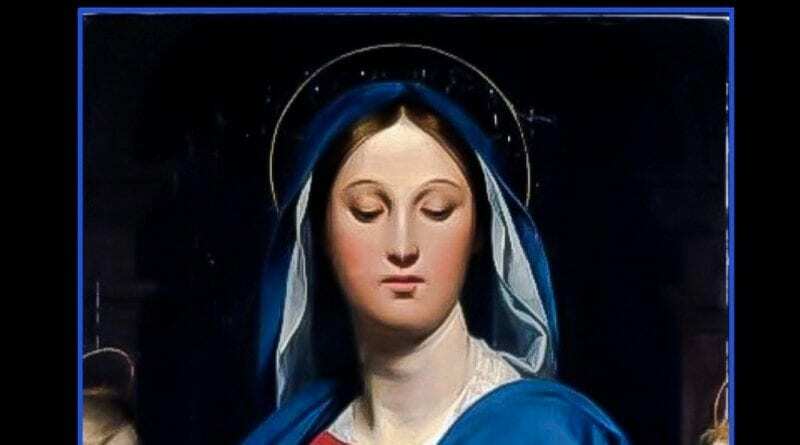 The following twelve refer to Mary as Mother; Mother of Christ, Mother of the Church, etc. Following the twelve, there are thirteen symbolic titles which bring our attention to Our Lady’s virtues and her celebrated role in the history of salvation. Included in this group are Mirror of Justice, Seat of Wisdom Cause of Our Joy, and Spiritual Vessel. We then come to four titles which praise Mary as comforting and helpful. Here she is referred to as; Health of the Sick, Refuge of Sinners, Comforter of the Afflicted and Help of Christians. And lastly, there are thirteen titles where we are addressing Our Lady as Queen. These include Queen of Angels, Queen of Martyrs, Queen of the Most Holy Rosary and Queen of Heaven. So, here you have some of Mary’s title with which you are familiar. But what about all the others? What are they, why were they given and what do they mean? I don’t know how many titles, in total, have been given to Our Lady. Some are devotions, some are from Marian apparitions and many were given by saints. Although I don’t know every title, I do know that there are many; far too many to include in one article. So, I’m going to give a few and in the future, offer more articles with more titles. There will probably be titles with origins I cannot explain but I’ll do my best to offer as much information as I am able to find. 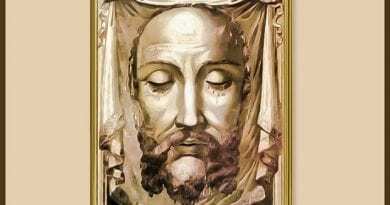 This title was given to Our Lady somewhere about the year 650 by Saint John Damascene, a Doctor of the Catholic Church. He used it in a writing on the Assumption (or Dormition) of Mary. He wrote, “”For there was need that this dwelling meet for God, this undug well of remission’s waters, this unploughed field of heaven’s bread, this unwatered vineyard of immortality’s wine, this olive-tree of the Father’s compassion, ever green and fair and fruitful, be not imprisoned in the hollows of the earth…” In this writing, Saint John Damascene also refers to Mary with other titles; Undug Well of Remission’s Waters, Unploughed Field of Heaven’s Bread, Olive-Tree of the Father’s Compassion, Ever Green and Fair and Fruitful. Immaculata is the Latin form of the word, immaculate or pure. This title for Mary originates from her title, Immaculate Conception, which began in Lourdes, France, when Mary identified herself to Saint Bernadette saying, “I am the Immaculate Conception.” Although the title is commonly known, the title, Immaculata, is not often used in present times. Saint Maximilian Kolbe always addressed Our Lady as Immaculata. 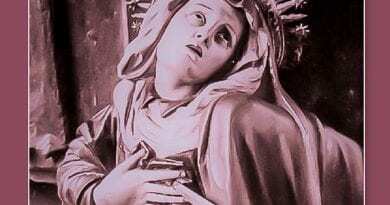 For many years, Saint Maximilian Kolbe questioned why Mary referred to herself as the Immaculate Conception. He saw this as nearly calling herself divine and he knew that Our Lady is not divine and was far too humble to refer to herself as such. Divinity is God’s alone. He did not quite comprehend why Mary, who was immaculately conceived, would use the grace of her conception as her name. He had always thought of the Holy Spirit as the Immaculate Conception and the Holy Spirit is divine. After many years of struggling with this question, he came to the realization that Mary is the created Immaculate Conception and the Holy Spirit is the uncreated Immaculate Conception. To explain his theory further — his belief was that Mary was created in time while the Holy Spirit always existed and was not created but was begotten. With this in mind, he concluded that Mary was the created Immaculate Conception and the Holy Spirit, because it is a part of the Trinity and was “begotten”, is the uncreated Immaculate Conception. The Cathedral of Our Lady des Champs (Our Lady of the Fields) was blessed by Saint Denis, the first Bishop of Paris, in the year 250. The land was originally the site where pagans worshipped Ceres, the pagan goddess of agriculture. Saint Denis blessed the site, driving out pagan demons, placed an image of Our Lady there and dedicated the site to her. The people of Paris have, since, been honoring Our Lady under the title Our Lady of the Fields. An image of Mary is, to this day, still seen there on a small stone which Saint Denis brought to France. 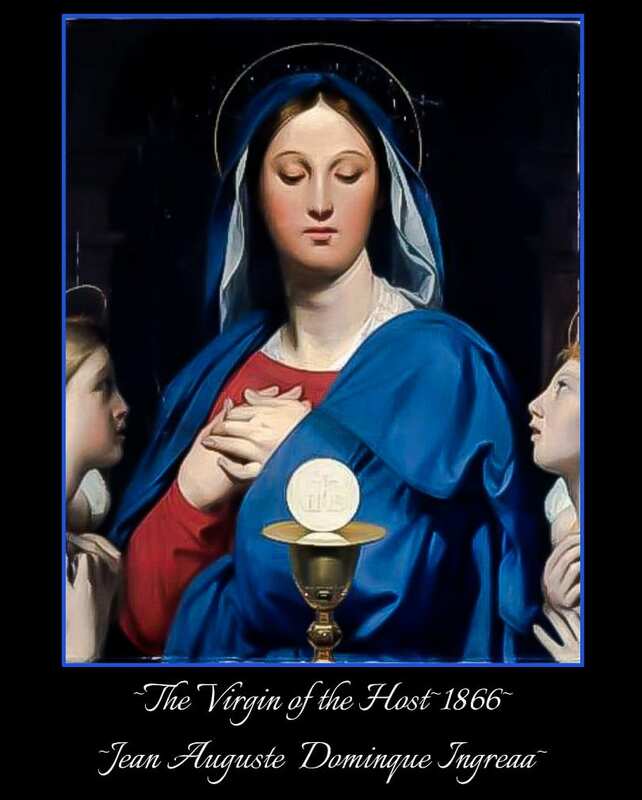 We know that Jesus is the Eucharist so it is easy to understand why Mary would be called Mother of the Eucharist. 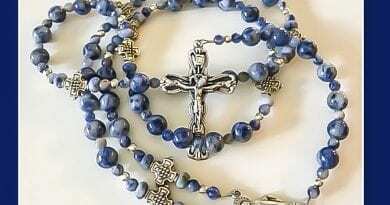 Marilyn Nash is a rosary artisan who, with her husband, creates one-of-a-kind and limited edition themed rosaries. She is a writer and author of the book, The Sacred Strand, Praying the rosary with saints and artists. In addition, the former interior designer is an artist and creates one-of-a-kind jewelry, handbags, and wearable art. Certified in Religious Education, Marilyn has taught both children and adults, specializing in Catholic themes, doctrine related to Mary and the Rosary. She is also a Lector and Extraordinary Minister of Holy Communion. Her passion is painting sacred and spiritual art.